SUFFERING FROM LOWER BACK PAIN, Neck strain, Bad Posture, Hunching, Ready to improve your posture. If you answered YES to any of these, then it’s time to make the switch to an Ergonomic Kneeling Chair. This uniquely designed posture chair can replace any traditional chair, with the added plus of health benefits you can actually feel. 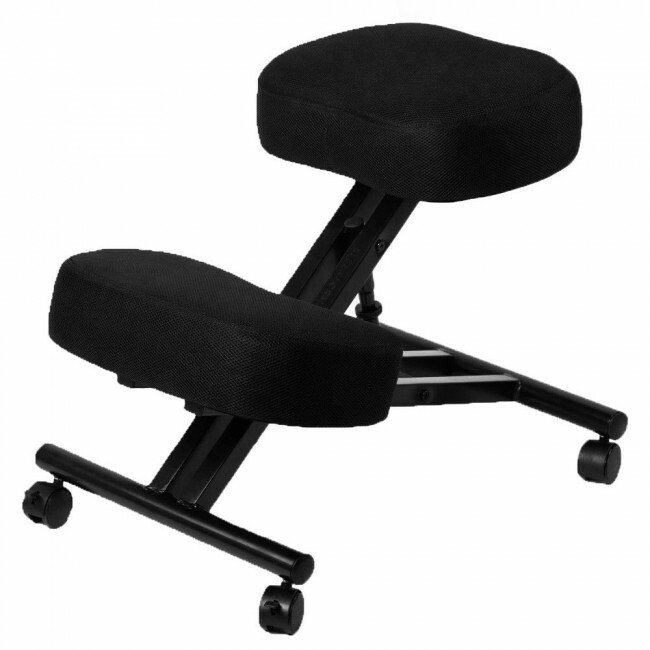 But this is not just a chair for back pain but is a perfect chair for meditation and office. BETTER POSTURE There is no reason to hunch over your keyboard or desk for hours on end anymore. With our seat cushion angled at a comfortable 90 degree, this posture chair has functional design that promotes better posture and more comfort. This angled kneeling desk chair will keep your back at an upright position, distributing your weight evenly throughout your buttocks and legs, all while keeping your spine aligned. MULTIFUNCTIONAL Our chair is just not just an ergonomic desk chair. Once you start feeling the relief and comfort that comes from sitting at our kneeling chair that is actually good for you, you will want to use it everywhere. Thankfully, it comes equip with four rolling wheels so it can easily be maneuvered throughout your home or office. Turning itself into a reading chair, meditation chair, or typing chair. DOUBLE CUSHION SIZE The Ergonomic Chair has 2x more cushion than our average competitors. That is twice as much comfort for your buttocks and knees, allowing you sit comfortably without sinking through the cushion. And all of our cushion are made from 100 percent recycled foam. Environmentally friendly and comfortable. ADJUSTABLE HEIGHT You can adjust the chair to a size that fits your personal needs, anywhere from 21 inches to 28 inches and can hold up to 250 lbs. This adjustability will allow you to find the perfect position that fits your specific needs. Once you sit in our ergonomic chair you will wonder why it took you so long to make the switch from an uncomfortable desk chair, to a kneeling chair.